NASA is taking a close look at the December launch optionsfor the final flight of space shuttle Discovery as engineers continue to studyfuel tank issues that have kept the spacecraft grounded for weeks. The next launch opportunity for Discovery'sfinal mission is no earlier than Dec. 17 at 8:51 p.m. EST (0150 Nov. 18GMT). But, in a news conference last week, shuttle program manager John Shannonsaid that he would only feel confident with a mid-December flight ifengineering teams had a firm understanding of what initially caused the cracksin the metal ribs on Discovery's external fuel tank. "We'll leave the option open for a launch window forDec. 17, but a lot of data has to come together to support that," Shannonsaid in the Nov. 24 briefing. Top shuttle officials will meet Thursday (Dec. 2) to reviewDiscovery's status and discuss the potential of a December launch. Discovery's next available window opens on Dec. 17 and runsthrough Dec. 20, giving NASA three possible launch attempts in four days.Mission managers are unlikely to push beyond Dec. 20, however, as the agencywould want to avoid having Discovery's 11-day mission overlap with thetransition into the new year. "They've never gone over the New Year's holiday,"NASA spokesman Allard Beutel told SPACE.com. "They've never done itbefore, and they prefer not to, but it's not something so terrible. It's notthat the system would crash ? the computers just have to be reset." Beutel likened the problem to the Y2K issue of 2000, butstressed that it is not actually the same thing. The computers on NASA's space shuttles are programmed sothat at the end of the year, the systems need to be reset to reflect the date asJan. 1, instead of Dec. 32, Beutel explained. In other words, at the end of theyear, the shuttle computers have to be reconfigured to change from day 365 to day1. "In general, to shut down and reset the computers, theyneed to be safely on the ground, landed or docked to the station," Beutelsaid. "In theory, they could do it while they're in flight, but that'snever been done before." Discovery is slated to deliver a new room and a helper robotto the space station during its final flight. The mission is NASA'ssecond-to-last scheduled shuttle flight before the fleet is retired in 2011. Anextra shuttle mission has been approved by Congress and President Obama, but ?finalfunding authorization by Congress is still pending. Space traffic is another consideration for Discovery'sDecember flight options. If Discovery is cleared to launch on Dec. 17, the shuttleand its six-astronaut crew will reach the International Space Station on Dec.19, only two days after the arrival of three new station crewmembers also boundfor the orbiting lab. A Soyuz rocket carrying NASA astronaut Catherine Coleman,Russian cosmonaut Dmitri Kondratyev and European astronaut Paolo Nespoli isscheduled to launch from Kazakhstan's Baikonur Cosmodrome on Dec. 15. The Soyuz TMA-20 will dock at the space station on Dec. 17,and while this could be the same day as Discovery'sfinal launch, the two events will not conflict. After liftoff, it will takeDiscovery and its crew two days to enter into the station's orbit, catch up,and then dock with the orbiting outpost. If, however, NASA is unable to launch Discovery in Decemberand the STS-133 mission is pushed into 2011, the agency will have to establishthe next launch window while balancing the space station program'salready-full schedule. "All windows are, to some degree, negotiable ? it'sjust how much you can negotiate," Beutel said. "But, that doesn'tmean it's always going to be practical enough to be feasible. We have to workwith the international partners and the station to change things around." "There are a dozen and a half rockets and spacecraftheading to the station next year, so there's a lot of traffic," Beuteladded. "Then there are spacewalks and work going on at the station. Allthat stuff has to be factored in." As it currently stands, NASA would be unable to launchDiscovery during most of January, due to unfavorable sun angles that couldcause parts of the shuttle to overheat while it is docked to the station. Acouple of days may open up early in February, Beutel said, ahead of the nextclear cut launch window on Feb. 27, which was originally reserved forEndeavour's final spaceflight ? the STS-134 mission. 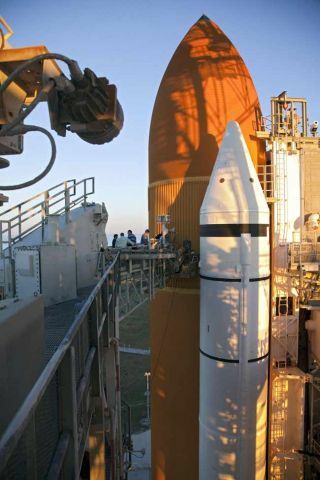 If needed, Endeavour's last mission could be rescheduled forthe end of April, NASA officials have said. Still, once Discovery has been given the clearance to fly,many of the subsequent decisions on how best to carry out the mission will beguided by the requirements of the space station and its program managers. "The shuttle program is supporting the InternationalSpace Station," Beutel said. "It's ultimately what that program andour international partners need."